OSWEGO, NY – Working with the Oz Roller Girls, the Oswego County Humane Society recently raised enough money to sponsor an upcoming spay/neuter clinic. The Oz Roller Girls provided a portion of proceeds from its May roller derby bout, where Humane Society mascots Porky and Buddy collected loose change donations. 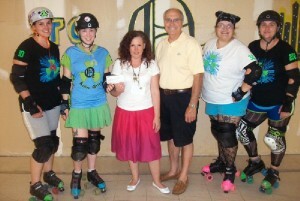 From left are Kannonball Kat-astrophe (Katherine Hansen) and Abbie Cadaver (Mallory Wills Taber) of the Oz Roller Girls, Adele Ferry and Dan Capella receiving the check on behalf of the Oswego County Humane Society, and rollergirls Murmaider (Vanessa Vickery) and Storm Warning (Toni Pavo). The Oz Roller Girls return to action at 6 p.m. Saturday with a doubleheader at Crisafulli Rink in Oswego.